Sun Joe SPX4000 2030 PSI Review: Should You Buy Yay or Nay? 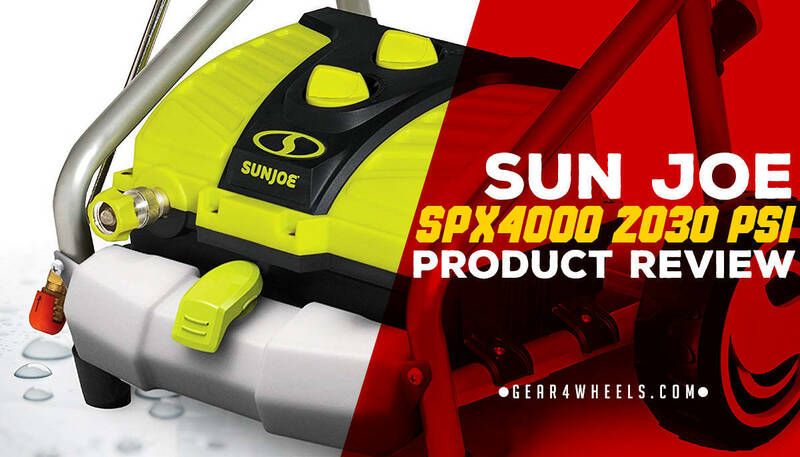 This review looks closely at a pressure washer with a very small footprint; the budget range Sun Joe SPX4000 is small, yet perfectly formed and ideal for home-use. Sun Joe produce compact pressure washers for a variety of uses, such as the 3001 and 4000, though they all share the same compact design. This model makes our list for these reasons, plus the fact that it carries such a small price tag for a budget to mid-range model. Sun Joe is known for being one of the leading brands for home-use washers. As is the case with most Sun Joe washers, this model has a full 2-year warranty. Budget and mid-range washers are known for their ease of use; this one is no different. For smaller home-based tasks, this model is perfect. It’s also very inexpensive. The Sun Joe SPX4000 2030 PSI is one of a line of impressive washers produced by the Sun Joe company (who also produce Snow Joe equipment). Their SPX3000 model was named the #1 Best Seller within the USA in 2017, so you know you're in good hands. In terms of price and performance, these machines are often referred to as the best in the industry for their category. Electric pressure washers are specially designed for prolonged, intense cleaning outdoors, and the Sun Joe range targets the casual home user who only needs a model good enough to clean their vehicle and exterior home surfaces. Decking, driveways, walkways and exterior walls or fencing are the kinds of surfaces that you should be targeting with the SPX4000. Anything larger and you’ll probably need to consider a premium-range pressure washer. Though Sun Joe only allows their own parts to be used in conjunction with this model, they do include 5 different spray nozzles straight out of the box, which should be sufficient for most home tasks. These nozzles include 0°, 15°, 25°, 40°, and one for soap. Each of these connects easily to the end of the want, which is also included within the box, using a quick-connect mechanism. The machine comes fully assembled straight out of its packaging, so there's no delay in getting up and running. The only exception to this is the hosing, which needs to be connected to the rear. Once this is done, you can select your spray intensity with the quick-connect tips. Built into this pressure washer is an onboard 54.1 fluid oz. detergent tank, which allows customized injection of cleaner into the water stream for targeted cleaning. The machine also features Sun Joe's exclusive Pressure Select Technology feature, which allows on-demand switching between different PSI settings, as well as the TSS, or Total Stop System, which automatically preserves energy when the washer is not in use. 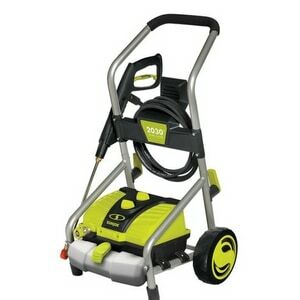 Additionally, this pressure washer features a built-in hose reel for retracting and storing the hose when not in use, as well as a 35-foot power cord that easily allows a wide reach when trailing from indoors to outdoors. Sun Joe has the title for #1 Best Seller on one of their similar washers and this is for a good reason. The manufacturer’s range of washers is hard to match in price and performance when shopping for a simple washer that is suited for home use. This model features some unique features that make it stand out from competitors, including the Pressure Select Technology, as well as an onboard detergent tank, which is a rarity at this price point. As a result, we have no hesitation in recommending this model to consumers.